Mohon untuk tidak digunakan untuk berbuat kejahatan. Email log delivery – keylogger can send you recorded logs through e-mail delivery at set times – perfect for remote monitoring! FTP delivery – Ardamax Keylogger can upload recorded logs through FTP delivery. Network delivery – sends recorded logs through via LAN. Clipboard logging - capture all text copied to the Windows Clipboard. Invisible mode makes it absolutely invisible to anyone. Ardamax Keylogger is not visible in the task bar, system tray, Windows 98/2000/XP/2003/Vista Task Manager, process viewers (Process Explorer, WinTasks etc. ), Start Menu and Windows Startup list. Visual surveillance – periodically makes screenshots and stores the compressed images to log. Security - allows you to protect program settings, Hidden Mode and Log file. Web Update – Ardamax Keylogger can check the availability of updates, download and install them automatically. Thus, the latest version of Ardamax Keylogger will always be installed on your computer. Application monitoring – keylogger will record the application that was in use that received the keystroke! Time/Date tracking – it allows you to pinpoint the exact time a window received a keystroke! Powerful Log Viewer – you can view and save the log as a HTML page or plain text with keylogger Log Viewer. 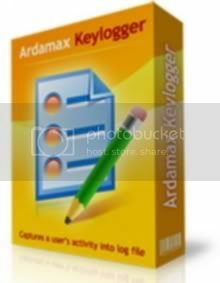 Small size â€“ Ardamax Keylogger is several times smaller than other programs with the same features. It has no additional modules and libraries, so its size is smaller and the performance is higher. It records every keystroke. Captures passwords and all other invisible text.